Tag line: "A dying planet. A fight for life"
Even today, many fans rank 1982’s The Wrath of Khan (the second cinematic voyage undertaken by Captain Kirk and his crew) as the series’ best film. 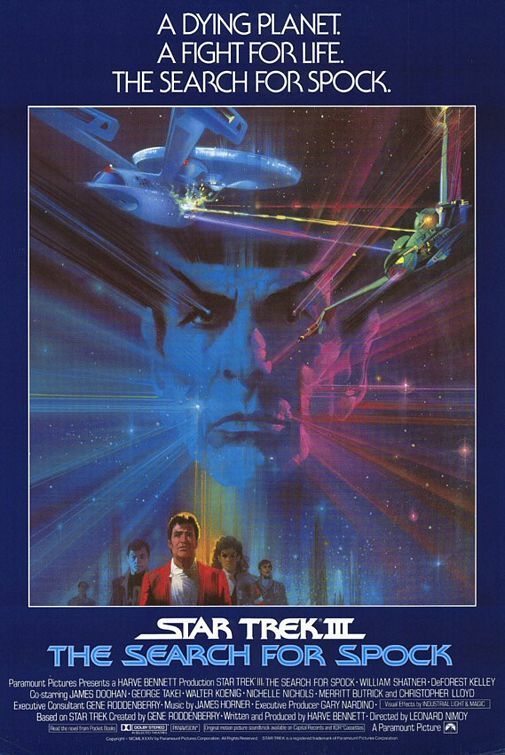 Which, as you can imagine, makes it a pretty tough act to follow, and to be sure Star Trek III: The Search for Spock has its detractors (some speak of an “odd-number” curse, where the odd numbered films in the series, this 3rd installment included, are inferior to those with even numbers, i.e. Wrath of Khan). But as a direct sequel to Khan, Star Trek III continues the story and even sets the stage nicely for some of the series’ later entries. Still reeling from the death of his beloved friend Mr. Spock (Leonard Nimoy), Admiral James T. Kirk (William Shatner) pilots the wounded U.S.S. Enterprise into federation space, where it will dock for repairs. But following an unusual encounter with ship’s doctor Leonard “Bones” McCoy (DeForest Kelley), as well as a meeting with Spock’s father, Sarek (Mark Lenard), Kirk comes to believe that Spock’s spirit lives on, and that he must retrieve his friend’s body from the newly-formed Genesis planet to complete an ancient Vulcan ritual, one that will allow Spock to finally rest in peace. Unfortunately, Kirk’s request to take the Enterprise back to Genesis is denied by Starfleet command; the Enterprise, now 20 years old, is to be decommissioned, and its crew assigned to other duties. But Kirk isn’t the type of officer to take “no” for an answer, especially when the well-being of a member of his crew is at stake, so with the help of Chief Engineer Montgomery “Scotty” Scott (James Doohan), helmsman Hikaru Sulu (George Takei), navigator Pavel Chekov (Walter Koenig), and communications officer Uhuru (Nichelle Nichols), Kirk commandeers the Enterprise and sets a course for Genesis, realizing full well that doing so will mean the end of his Starfleet career. While this is happening, Dr. David Marcus (Merritt Butrick), Kirk’s son and the man behind the Genesis device, and Lt. Saavik (Robin Curtis) are on-board the science vessel Grissom, which is orbiting Genesis. Sent to carry out a series of experiments on the new world, Marcus and Saavik are taken by surprise when a humanoid life form is detected on the supposedly barren planet. The two beam down to investigate, but shortly after doing so the Grissom is attacked and destroyed by a Klingon Bird of Prey. The Klingon commander, Kruge (Christopher Lloyd), is determined to obtain the information for the Genesis device, which he believes would make a powerful weapon. By the time the Enterprise arrives, David and Saarik, as well as a third humanoid (not yet identified), are Kruge’s prisoners, forcing a stand-off between the Federation and the Klingons. What neither side realizes, though, is that the Genesis planet is unstable, and within hours it will self-destruct. 3. Kruge’s plan to steal all information pertaining to the Genesis project (which takes up a fair portion of the film’s first act). But, unlike some critics (Richard Schickel called Star Trek III: The Search for Spock “overplotted”), I felt director Nimoy did a decent job juggling the movie’s various stories while, in the process, keeping each one interesting. As for the cast, Shatner and company were comfortable enough in their respective roles by this point, and deliver strong performances as the crew of the Enterprise; as does Christopher Lloyd, whose Kruge is as determined as Kirk to see his mission through. And like The Wrath of Khan, The Search for Spock has a key scene of high drama, which it carries off quite well. 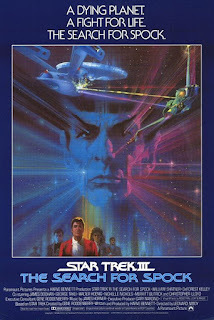 In addition, some of the events of Star Trek III: The Search for Spock had a direct bearing on a few later Trek films, including 1986’s The Voyage Home (in essence a sequel to this movie) and one of my personal favorites, Star Trek VI: The Undiscovered Country (a journal entry by Kirk, in which he references a key moment from Star Trek III, is used against him in a trial on the Klingon home world). So, while it may not be as well-respected as The Wrath of Khan, The Search for Spock is better than its reputation would lead you to believe, and, in my opinion, it blows the “odd number curse” theory right out of the water.